Very cleverly conceived by Pro Co Sound's director of engineering, Gerry Carpenter, the StageMaster Series SMA0804FBQ-25 Snake is logically thought out and designed for fixed installations and light road and stage use. The rugged and reliable design features the latest in connector technology and a cable that is extremely flexible for easy coiling. The StageMaster stagebox is built from a thick 16 gauge connector plate with a blank template overlay that allows channel ID numbers to be written on it. 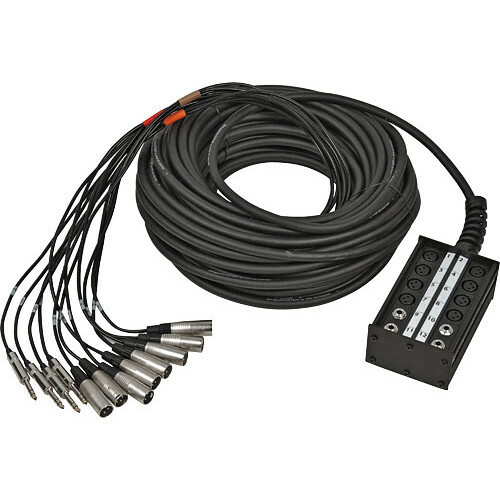 The stagebox features Pro Co Duralink cable, and the fanout cable spread is 3-4' long to allow for the individual connectors to link to multiple audio components. Box Dimensions (LxWxH) 14.5 x 13.0 x 3.3"